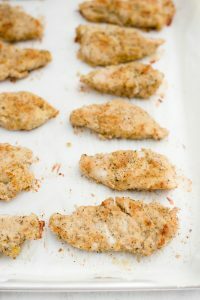 These almond meal chicken tenders are dipped in an egg wash and then rolled in seasoned almond meal (or almond flour) for an awesome crispy outside and juicy inside. It’s basically healthy fried chicken. I got this recipe from my sister (more on that later) and love it! I typically buy almond meal in the bulk bins at my local health food store, but you can buy it in the health food section of lots of grocery stores. I love using almond meal because it’s a really healthy substitute for traditional breadcrumbs and is a great source of healthy fat + protein, too. First, line a baking sheet with parchment paper and preheat oven to 425 degrees. Pound each chicken breast to an even thickness with a meat mallet or even a heavy skillet. Cut each piece into 3-4 strips. Set up an assembly line with the chicken, one beaten egg in a small bowl, and almond meal (with spices added) on a plate. Dip chicken tender in the egg, and then roll in the almond meal. Place chicken tender on the baking sheet and repeat with all of the pieces. Then, bake for 10 minutes, flip each piece, and bake for 10 more minutes. That’s it! You can serve these almond meal chicken tenders with ketchup or honey mustard for dipping. And every “fried” chicken dinner needs some sides, right? These would be so good with homemade mac ‘n’ cheese, garlic green beans, roasted Brussels sprouts…yum. Or if I’m short on time/not in the mood to wash pots and pans, I really love using high-quality frozen sides. For this meal, I heated up 1) Alexia cauliflower risotto with parmesan and sea salt and 2) Alexia mashed butternut squash with butter & brown sugar. They’re designed as starch alternatives for a lighter option, and they’re both amazing, but the cauliflower risotto was extra incredible and so creamy! 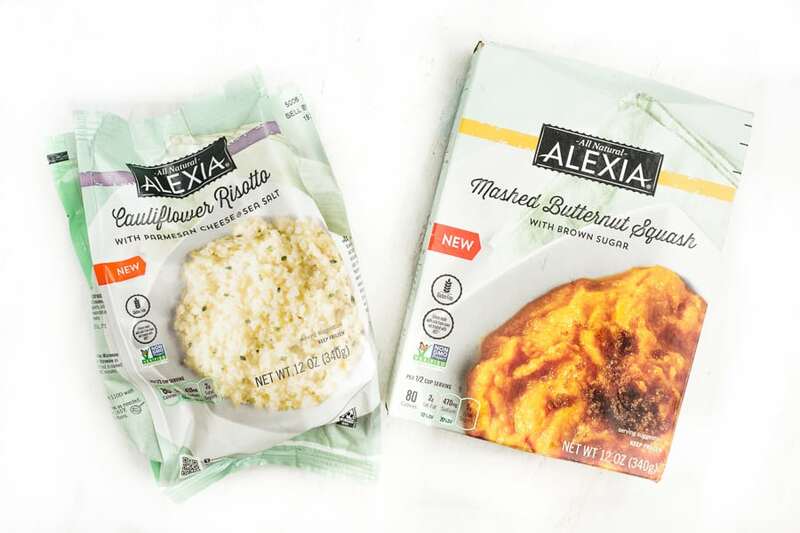 I love that Alexia complete side dishes have really simple ingredient lists with things I’d use myself, including organic dairy and premium vegetables. All of their sides are non-GMO project verified and gluten-free. They don’t require any additional ingredients to prep (other than a splash of water), they cook right out of the bag, and they’re ready in less than 10 minutes. In a perfect world, I’d love to make everything homemade all of the time. 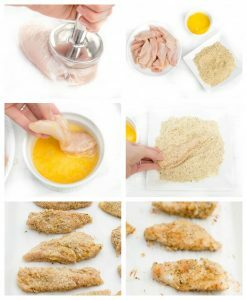 But as a busy college girl (with also a less-than-ideal dorm kitchen situation), frozen premium side dishes are a great option to go along with a simple protein like these almond meal chicken tenders!And for the story behind the recipe (if you’re like me and you care about this sort of thing! ): A few weekends ago, I visited my sister and brother-in-law in Baltimore and stayed with them for just a short 24 hour visit. When I got there, they cooked a super delicious dinner– these almond meal chicken tenders, with sautéed spiralized zucchini noodles on the side. And then we curled up on the couch with warm brownies and ice cream to watch our favorite episodes of The Office (fire drill episode, anyone?). If you try these almond meal chicken tenders, feel free to let me know in a comment or take a picture and tag me @livbane on Instagram. Hope you enjoy! Pound chicken breasts to an even thickness, about 1/2 inch thick. Cut each breast into 3-4 strips of similar size. Mix almond meal and spices together on a plate with raised edges. In a separate bowl, beat the egg. Dip each chicken tender in the egg, then roll in the almond meal mixture. 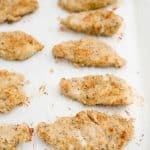 Place on baking sheet and repeat for all chicken tenders. Bake for 10 minutes, flip, and bake for 10 additional minutes. Serve with ketchup and honey mustard for dipping, plus healthy side dishes like mashed butternut squash, cauliflower risotto, etc. I put a little bit of cayenne pepper in the mix too for a little kick! Oh, good to know!! I’ll make a note of that on the recipe. I’m so glad you enjoyed this meal! I love cooking for you! And I agree, both sides were awesome, and I especially liked the cauliflower risotto! These look so good! Definitely popping them on my must try list! That risotto looks SOOO good; I love risotto so much. And the idea of crusting chicken tenders with almonds is such a good one especially if someone has to be gluten or grain free, but I know they would love to have chicken tenders. Yes!!! So prefect for someone who eats gluten or grain free! My mom eats mostly grain-free and she was excited to have these! This is interesting as I have never thought about using almond meal as a substitute for bread crumbs. In fact, I love this alternative and can’t wait to try it during my next fried chicken tenders. Thank you for sharing. I hope you love the almond meal substitute, Sheila!! Is it supposed to be 12 tsp of garli Powder or 1/2 tsp?